A shrinking percentage of physicians now own their own medical practice, according to new data from the American Medical Association. The share of physicians with ownership stakes in a medical practice declined to 47.1% in 2016 from 53.2% in 2012, the AMA found, marking the first time that the majority of physicians were not practice owners. Doctors, driven particularly by the younger demographic, have been shifting from owning their own practices to joining larger practices, research shows. Yet, that trend has seemingly stalled, according to AMA data. The percentage of physicians in hospital-owned practices or who were employed directly by a hospital was the same in 2016 as in 2014 at 32.8%, but higher than 2012's 29%. In 2016, 21% of doctors in hospital-owned practices said their practice had been acquired by a hospital in the past five years compared with 26.9% in 2012. Consultants attributed the slowdown to hospitals having "as many practices as they can handle at this point," said the study, written by AMA Senior Economist Carol K. Kane. "Physician compensation is one of the fastest-growing expenses in health systems," said Joel French, CEO of SCI Solutions, which offers web-based access management products that connect patients, referring physicians and hospitals. It has become as high as 10% of total expenses for some systems, he added. "The burden is not sustainable." 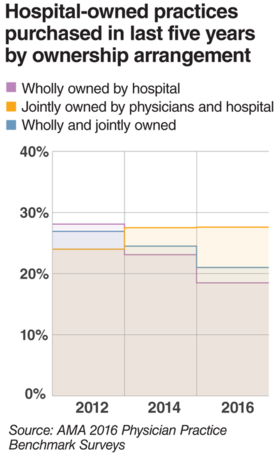 Hospital ownership is more prevalent in multispecialty practices that include primary-care physicians, research shows. In 2016, 45.7% of multispecialty practices that included primary-care providers were owned by hospitals compared with 33.3% that did not have primary-care doctors. Nearly 14% of multispecialty clinics were wholly owned by a not-for-profit foundation, the study found. While most doctors deliver care in smaller practices of 10 or fewer physicians, the data points to a gradual shift toward larger practices. In 2016, 13.8% of physicians were working in practices with 50 or more doctors compared with 12.2% in 2012. The AMA's Physician Practice Benchmark Surveys were performed in 2012, 2014 and 2016 and included 95,262 physicians from across the country who provide at least 20 hours of patient care per week.